I’m always on the lookout for the old Annapolis-built PRS’s. These old-factory models, easily identifiable with the original small logo and short neck heel, were actually hand made, before the move to the new factory and use of CNC machines. This one’s finished in Scarlett Red with a pleasing flamed maple top, certainly not a “10” top but nice enough. A lot of people incorrectly refer to Annapolis models as “pre-factory”, the reason for which I haven’t a clue. Regardless, these guitars are widely thought to be superior to guitars built at the new Stephenville factory which opened in ’96. Around the time of the move PRS eliminated most of the hand-crafting in favor of CNC machines. Features of this guitar includes maple cap over one-piece mahogany body, moon inlays, one-piece Mil-Com tremolo, Phase I locking tuners, and “Regular” (aka Standard) neck profile which is 1/16″ more narrow than a wide thin/fat, and the same depth as the wide fat (1 21/32″ nut, 27/32″ depth). Pickups are the stock HFS and Vintage Bass with the standard 5-way rotary selector, volume and tone. 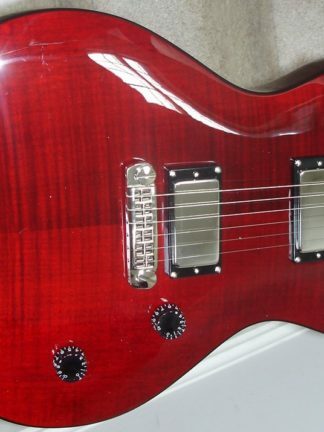 The Custom 24, especially with the tremolo bridge, has a looser feel than a Custom 22, plus a “longer” neck, i.e. with the bridge and bridge pickup are set further forward in the body which means it has the same 25″ scale as the Custom 22, but the neck extends slightly further from the body. It’s not as much a Les Paul feel, but a PRS feel. Now over 25 years old this guitar is officially vintage and it’s noteworthy that this is the 13,372nd guitar PRS had built in the 7 years they had been in business. By contrast, that’s about the current ANNUAL production now (around 12,000 produced in 2016). Cosmetically it has some buckle scratches and minor dings in the clear coat, but no major issues and frets are in nice shape. There are no serious issues such as cracks and there’s no finish checking. Whenever you play one of these older PRS’s you can almost sense the meticulous human attention to detail as you’re holding a guitar that will likely never be hand-crafted again. Prices on Annapolis-era Customs continue to rise but they’re still a good value, especially when they’re cheaper than a comparable new one. It plays like all old PRS’s with low action and no dead spots. Nicely priced for an Annapolis model at $2100. Includes clean original case and trem arm.